Your Premium discount ( tax credit) through the Marketplace - monthly - based on your estimated income and family size for 2014. 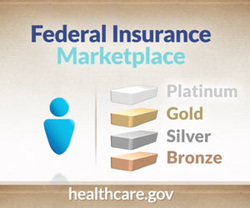 Starting November 15, visit HealthCare.gov and log into your Marketplace account. Answer a few questions to get to your 2015 application – it will be pre-filled with your latest information from 2014. Step through each page of your application and make changes if you need to. This is important – even if none of your information has changed, you might be eligible for lower costs than last year! You also can call the Marketplace Call Center at 1-800-318-2596 to review or make updates over the phone. After you submit your 2015 application, check your eligibility results carefully. Even if none of your information changed, you might get diffe﻿re﻿nt co﻿st savings ﻿because of changes in the Marketplace. Once you have your NEW premium discount tax credit eligibility for 2015 - please let us know by emailing us at dave@troutinsurance.biz . We may then COMPARE. Now we can c﻿ompare plans for 2015 and apply your premium discount tax credit. Stay covered for 2015! Contact the insurance company to confirm your enrollment. Make sure to pay your premium. This is important to get the covera﻿ge you want and the most cost savings that you’re eligible for. If you don’t finish all of the steps by December 15, the marketplace will try to enroll you automatically so you stay covered. But this coverage might not be your best option for 2015 and you could miss out on cost savings.